The growing popularity of Readers Theatre proves you don’t need scenery or costumes to create a stirring dramatic performance. This collection of scripts by a nationally-known authority on the subject will add a new theatrical look to your drama program. Their ease of performance makes these scripts ideal for classroom use, as well. A variety of stories from the pens of classical and contemporary writers, journalists, and playwrights, all adapted to readers theatre performance, make this text a truly valuable part of any drama library. The material includes comedy, mystery and suspense, Christmas stories, folklore, and children’s classics. Classic and contemporary works by William Shakespeare, James Thurber, Rudyard Kipling, O. Henry, Gordon Bennett, and many more are included. A teacher’s guidebook of ideas for introducing Readers Theatre to young students. 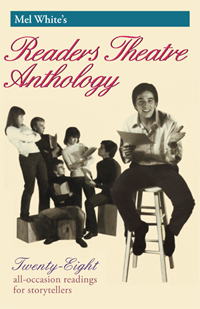 Includes step-by-step instructions on a variety of ways to use Readers Theatre in the classroom.